"Biography of Suni McGrath . . .1956 Suni starts guitar, including lessons . . . 1960 Gives first performance at talent show, about 300 in audience As a pioneer of fingerpicking, he begins to create the fingerpicking style . . . 1961 One of the first 12 string solo artists, WYSO radio has Suni McGrath play his fingerpicked solo 12 string on radio at Antioch College where he becomes friends with Ian Buchanan and others at “the Bakery” . . . 1962 In Detroit, McGrath is asked by Detroit Folklore Society to give first concert on his 12 string Gibson. Many in 2005 still remember this . . . 1963, He takes lessons with Rev. Gary Davis and Mississippi John Hurt. A record scout. hears Suni McGrath at Newport, R.I. Festival where he came up from Greenwich Village his regular playing area, and signs him to first recording contract on the Piedmont label, Mississippi John Hurt’s label . . . 1965 Suni invents, far-out odd-time rhythms fingerpicking results in tape sent to Folkways Records . 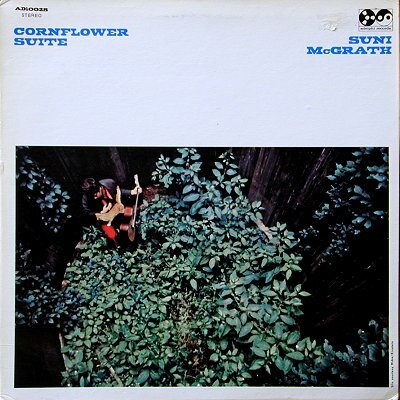 . . 1968 Suni McGrath, rediscovered by new and different label, taken to east coast to record first issued album . . . 1971 He records the earliest version of the Celtic/Irish/modal (he is Irish ! ) “The Star of County Down”, . . . 1972 Suni McGrath’s records fantastically reviewed in many magazines, newspapers, and played on many radio stations nationwide. Nominee for “Guitarist of the Year” for his three albums: Cornflower Suite, The Call of the Mourning Dove, and Childgrove . . . 2001 McGrath is shown to his surprise, to be on the WWW Internet,~27 entries, among others,WFMU radio in New York often and repeatedly plays his work including his 12 minute symphonic masterpiece, “Cornflower Suite”, the Renaisance/classical style “Love Abides”, also, the earliest version of the Celtic/Irish/modal “The Star of County Down”, and the world famous flower power ‘60s style piece:“On the Riverpath She Waited” . . . 2005 Suni McGrath’s track called “Train Z” gets great reviews from critics and magazines such as BILLBOARD and MoJo (England). His 45 rpm “Seven Stars” does also." Absolutely fantastic guitar playing. Any Fahey/Basho/James Blackshaw fans surely need to hear this for all the great melodies and techniques. What a find this was for me. Some of the most fantastic folk music I've ever heard.